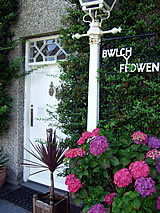 Bed & Breakfast accommodation in Porthmadog, Snowdonia, near to Criccieth and Harlech. Family friendly and pet free b&b close to many North Wales attractions including the Ffestiniog Railway, the Llechwedd Slate Caverns and Portmeirion. Bwlch y Fedwen is a substantial Grade II listed stone-built house located in the village of Penmorfa, about two miles from and overlooking Porthmadog. The house dates from the early seventeenth century, and was part of the Wern estate until around 1970. The house has a varied history, having been an Inn, a farmhouse, guesthouse and holistic retreat, as well as a family home. 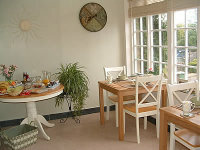 We have three double bedrooms with en-suite bath and shower facilities, colour tv / dvd and tea and coffee making facilities with a well stocked welcome tray. Start your day with a hearty cooked Welsh breakfast served at your table in the sunroom, which looks out towards Moel Y Gest. Or choose from our extensive breakfast menu, including a selection of fruit juices, cereals, fresh fruit and yoghurt. Our Welsh breakfast includes locally made Porthmadog sausages, bacon, and fresh free range eggs from a local farm. Vegetarian and fish options are also available. We have ample off-road parking conveniently located at the rear of the house, and guests have use of their own private entrance leading to the guest bedrooms. 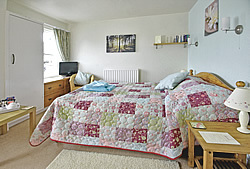 We have three spacious and comfortable double bedrooms, each with en-suite bath, shower and toilet facilities. Children are welcome, and we can supply a travel cot or single 'put up' bed in your room. Please enquire about children's rates. 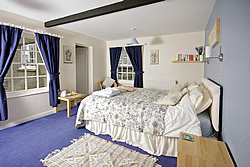 All rooms can be accessed via a separate door. All rooms are strictly non-smoking.